Advantage Usually cheaper to install, especially if combined with cooling, as in complete HVAC air conditioning systems. For most of the U.S. HVAC systems are the cheapest all-in-one system when they combine cooling as well to justify the higher costs involved with ductwork and installation. Disadvantage Lower Efficiency. Sure there are 95% efficient forced air systems out there but the number does not tell you the whole truth. By the time the air reaches its destination it has cooled off already and this may be an issue if ducts go through unfinished basements or crawlspaces. Furthermore, air pressure differentials (see below) pull in cold air from outside and force air conditioned air to the outside, ie. cause energy loss, unless the house is very well sealed off against air leaks.A/C cycles are also inefficient when they occur often and are short periods. Turning the gas flame on and off is inefficient. Because forced air has no energy buffer, short cycles are more likely to occur. In contrast, radiator heating systems use hot water (about 165 deg F, 70 deg C) and the system uses well over 50 gallons as a buffer. The cycles tend to be longer, keeping the flame on longer, and the water buffers energy for a very long time so that temperatures don’t drop as quickly. Disadvantage Air / room temperature fluctuation can be enormous and uncomfortable. This magnitude of this situation depends on the house as well but the principle is the same: when air, whether hot or cold, is pumped through the house, it will need to be a lot colder/warmer than the current indoor air in order to pull the temperature up or down. In the summer, the air registers will pump out very cold air in order to bring the house down 2-3 degrees.As soon as the A/C stops in the summer, temperatures will start rising again. Obviously in a well insulated home with very efficient doors and windows the fluctuation will be slower; nevertheless, the house temperature will fluctuate by 2-3 degrees, at least, because that’s how thermostats work. In addition, thermostats are usually one for the entire house, measured somewhere at the center. This results in much greater fluctuations at the edges of the house and on different floors. In the summer, the basement may be 5-10 degrees cooler because cold air remains low. At the same time if you have a finished attic right under your roof, that area will accumulate a lot of heat from the hot air rising up to the higher floors but also from the solar heat when the sun beats on the roof. Again good insulation is awesome to have but the effect remains. In the summer your upper floor A/C will have more work to do and the basement may get uncomfortably cold, while the attic is too warm.In the winter, certain rooms may be cooler than others due to less efficient windows and doors or simply because they are facing north (less sun) or because they have more windows than other rooms. You would need to set the thermostat higher in order to get those rooms comfortable, while making other rooms potentially too warm and uncomfortable.As temperatures go up and down each time the A/C turns on, your feel it going from too hot to too hot, which in my opinion reduces comfort and quality of life in general. Sure you get used to it, but once you switch your system to radiant and have constant temperatures in the house you’ll immediately appreciate it. Disadvantage Cold and hot spots. As mentioned above, no room will have the same temperature and even within each room there will be colder spots or warmer spots. Near windows and exterior doors there will be sensible energy loss; again, a bit of a comfort “penalty”. In the summer, if you have floor registers, the cold air will remain at the bottom of the room while the ceiling is warm. In the winter the floor will remain cold, so if you plan to walk around barefoot, you better like it cold!Sure some HVAC gurus may recommend that you have the ductwork made such, that each room has a return duct and a separate thermostat, and a return low and another higher up to compensate for all these effects. However, the expense of such a system is an issue. Luckily at least for the winter season a radiant system is far cheaper, easier to install and retrofit, and much more effective and comfortable. The summer season brings its own challenges, however. Disadvantage Dust is being blown around. This is a major nuisance. No matter how often you clean and vacuum there is always some dust building up and forced air systems are great in catapulting it into your throat and around the house. Again you get used to it but it’s not healthy and it’s annoying. If your house has floor registers, those will become dust traps, too. Sure you can buy expensive air filters but dust is still being blown around simply because it’s already in the room somewhere. Disadvantage Relative humidity fluctuates. You got to be observant to notice this one. When air is heated, it becomes dryer and in the winter this is a big health issue. Ideally you would want your indoor humidity levels at 40-50% constant, as would also want your temperature completely constant. In the winter when the A/C kicks in, hot, dry air is pumped through the house and you can notice it as your nose and throat dry up. For sensitive people, such as babies and people with allergies or asthma this can be more than just irritating, it can put your health at risk, see http://interact.stltoday.com/pr/local-news/PR110414065719229.So let’s buy a humidifier! That’s a great idea for the winter to increase the humidity level; however, the relative humidity level will still fluctuate by around 10% each time the A/C turns on. Disadvantage Air pressure differentials are built up, as air is sucked in and forced through crevices (doors, windows, even cracks in walls and ceilings, through insulation). Moisture is passed/forced through insulation materials, such as fiberglass, Rockwool. Ductwork always has some leaks where dirt, dust, moisture, and other pollutants may enter the duct. If ducts go through unvented crawlspaces they may even pick up radon, too. In extreme whether you can see the effects of air pressure differentials. When it’s very cold outside, caulk may detach from window frames and let air in. If the walls aren’t covered with a moisture barrier that is completely airtight, the air will be forced through it. The moisture in the air will condensate inside the fiberglass or Rockwool insulation and grow mold eventually. Air flow can cause condensation in very cold whether or in hot humid climates when moist, warmer air hits on a colder surface. Apart from insulation, this can occur behind drywall and around windows and doors. While all this is to be expected to some degree, forced air systems make this phenomenon worse by creating air pressure differentials. Disadvantage Noise. No matter how well a system is tuned and built, there is always some noise. When I renovated the entire house I spend months planning the ductwork and A/C system; the results are amazing compared to the previous system we had, but there is always some noise involved when air is pressured through ducts, filters, and registers. Disadvantage Air drafts. A good A/C system may be relatively quiet compared to one that isn’t engineered properly; however, air drafts are a major problem. If you sit near a floor register you freeze in the summer and feel uncomfortable in the winter. In both seasons the air draft is very dry and unhealthy as pollutants are moved around. If you are near an air intake you can also feel the air and it’s not a spot to ‘hang out’ while talking on the phone. Disadvantage Expensive ductwork. Ductwork isn’t cheap and it isn’t easy to install either. I asked five companies for a quote, they ranged from $15 to $30,000 for an average four bedroom house in the Washington, DC area. I managed to get it done for $4,500 including insulation but did the planning, demo, and some installation myself to ensure the ducts are sized and routed through the house the way I wanted. I doubled the size of existing ducts and ran them completely different than any of the companies had quoted. It turns out they just wanted to redo everything without figuring out what was wrong with it and how to do it right. That’s why they weren’t hired. Yes, they also weren’t hired because they wanted to rip off ;-)The expensive ductwork makes sense, however, when you combine forced air heat with A/C for the summer, so it serves two purposes. You need to make sure that air intakes and registers are placed correctly and that each room receives the right amount of air, not too much or too little. 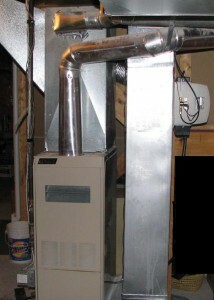 Disadvantage Ductwork requires additional space, and this may be an issue for retrofits. Some older houses don’t have room for air ducts. In newer homes air ducts are hidden in the walls; however, if you find out the ducts weren’t planned correctly in your new home, one day you’ll need to rip open most walls in order to expose and replace the ductwork, and that re-work is likely require additional space somewhere. Disadvantage Air filters are an additional expense. A good air filter costs quite a bit of money. Go to Walmart or Home Depot and look for filters with smog / smoke filtration and they cost over $13 each. If you have multiple (three) intakes as we have in our house, it’s 3 * $13. Interestingly a big filter costs as much as a tiny 12×12 filter… If you want allergens filtered, too, you are looking at close to $20 or more per filter. During peak seasons we need to replace the filter every six weeks or more often. Disadvantage Forced air systems require more maintenance than radiant underfloor heating systems or radiator heating systems, see my article on Buderus Installation. Radiant systems may require a pump replacement every 10-15 years, which costs about $250, and occasionally you may need to vent some air from the radiators but that’s all that’s to it. Disadvantage Centralized temperature control via one thermostat. Temperature is regulated from a central sensor; hence, each room ends up with a different temperature, depending on many factors. Some may become too hot or cold depending on room location relative to ductwork, A/C blower, and orientation of house (south-facing will be warmer when sun beats on house). Ideally each room should have its own temperature control and the only low-cost system that does that is the radiator heating system. Disadvantage Potentially hazardous situations can occur. Clogged filters or ducts can lead to dangerous situation and fire hazard; hence, more maintenance required (duct cleaning, visual inspections). In forced air systems powered by natural gas or some other combustible, carbon monoxide can enter the indoor air portion of the heat exchanger. This gas is odorless and absolutely lethal. You absolutely must have carbon monoxide detectors in all floors of your house. http://www.ci.bellaire.tx.us/857/Why-You-Need-a-Carbon-Monoxide-DetectorThis very issue is one of the main disadvantages of forced air systems in my opinion. Carbon monoxide and other serious pollutants can enter the house through microscopically small cracks in the furnace’s heat exchanger. On one side the furnace burns gas and the flame hits the metal and inside the other chamber the indoor air is passed through. Some day, sooner or later, that metal will crack open, it’s only a matter of time and by the time the monoxide detector senses it, it has been cracked open for a while…That’s another reason why you need the system inspected and the air filter needs to be replaced very often because air filters start restricting air flow very quickly as dust clogs the fine openings in the filter fabric. Disadvantage And more health risks: dust, mold, bacteria, smoke, and other particles are forced into lungs when air is forced through the house. Mold may build up inside AC unit, filters, and air ducts. Mold can grow in the summer, too, when moist air condensates on cold surfaces, for example inside air ducts. If the system isn’t running properly, for whatever reason, whether it was not planned or installed properly, or whether indoor pollutants are the issue, it all affects our health. For each of the above disadvantages you could do something about it and keep your existing system in good shape; however, if you are renovating you might want to look into radiator heating systems as well if you live in a colder climate where the heating season is long enough to justify additional system costs. Ready to get “hands-on”? Check out DIY Radiant Heat: How to Heat Your House with Buderus, it’s actually easy to switch to radiator panel heat! This article is quite popular and I noticed a few people here also work in IT. You may be interested in my Hyper-V backup post that discusses various Window Server backup strategies.